Traci Bryant Lightfoot has been appointed principal of Bruce Elementary. Ms. Lightfoot has served in a variety of roles during her 24 years in education, including teacher, program coordinator, instructional coach, and assistant principal. She began her career in HISD as a fifth-grade teacher and campus specialist at Barrick Elementary. She also served as a national trainer and school improvement specialist at the University of Houston. After two years of assisting struggling schools, Ms. Lightfoot worked at Klein ISD as an instructional specialist and program coordinator of Title 1 schools for five years. She returned to HISD in 2011 as a science teacher at Cullen Middle School, and was named assistant principal one year later. 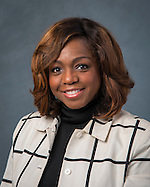 Ms. Lightfoot received her bachelor’s degree in Business Administration from Abilene Christian University and her master’s degree in Education from Prairie View A & M.
This entry was posted in District II - Rhonda Skillern Jones, Staff updates and tagged Bruce ES on August 6, 2015 by HISD Communications.